STOP Illinois SB3264 Dangerous Animals Act! Senator Heather A. Steans is backing a bill to ban our pets. Guys, this is more than Lions and Tigers which are already banned in IL (gotta have a USDA license, and the state reserves the right to challenge your right to own that animal even then... your average joe will not win this battle). This is the beginning to the end of everything but the most basic of animals. Dogs that protect our homes, family and property will end up being a thing of the past. Ferrets, hybrid cats, Servals, German Shepherds, Dobermans, pet snakes, pet lizards, you name it… this will eventually effect every home in IL. Call her and let her know how you feel about this bill. Then contact your IL lawmakers to have them support us on fighting this bill. SIGN THE PETITION AGAINST THIS BILL HERE OR ABOVE! CLICK HERE TO SEE WHO YOUR IL STATE LAW MAKER IS, AND TO EMAIL THEM AND CALL THEM TO APPOSE SB3264 DANGEROUS ANIMALS ACT. EMAIL & CALL FOLKS, ALL OF THE NEEDED INFO IS LISTED IN THE LINK. Ken's Exotics is a USDA licensed facility selling quality exotic pets and exhibit specimens! If you are looking for a Serval cat, you have come to the right place. I offer bottle raised Serval kittens year round. Take some time to read my care sheet on Servals to get a better feel for what life with a Serval is like before calling please. People Fear what they do not understand, and one person doing something STUPID in this hobby will result in a disastrous knee jerk reaction that will effect us all. It is our responsibility to not only own and raise our exotic pets responsibly, but to educate the public and the media that the hobby is not to be feared or banned. Again, the stats for people killed by horses, dirt bikes, atv and other hobbies far overshadow the very, very few accidents that happen in the exotic hobby... and 99.9% of the time anyone that is hurt in the exotic animal hobby/biz is the trainer/owner of the animals, not the public. Normal people do not let their animals loose on the public... this is the work of a sick, desperate man at the end of his rope (of course you will see animal rights activists sneak onto facilities and set animals free). Keep on top of all anti-pet laws and protect your right to own any animal. PIJAC now allows any and all pet owners to join after the sucess that we had with fighting HR669 (which is still on the table). Sign up as a member of PIJAC here and help keep the hobby alive! STAND TOGETHER AND WE CAN MAKE A DIFFERENCE! Visit REXANO to learn about new laws to ban pets. Buy our t-shirts below to help get the word out! and add your two cents worth about your own exotic pets and anything else you want to talk about. Also visit me on Face book at facebook.com/servals. Ken's Exotics is now on TWITTER! Get updates on new deals sent to your cell. Click here and sign up for our twitter updates. Here's a cute cat website, check it out. Looking for USDA licensed breeders of Fennec Fox, I buy entire litters! 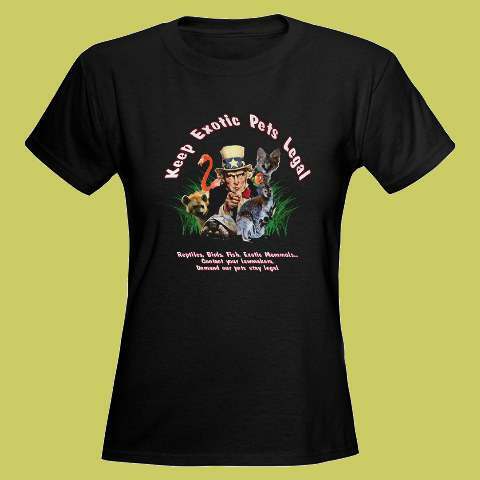 Exotic Pets T-Shirt for Sale Now! Time to come out of the Closet, Show the world that you keep exotic pets. Help get the word out to fellow exotic pet owners. Purchase one of our tees and wear it proudly every time you go to the dog park, zoo, pet shop, flea market, exotic animal sale, etc. The only way our hobby will stay alive is for EVERYONE ONE OF US pet owners, and pet lovers to call our state and federal legislators and tell them that they represent the people, and we the people demand exotics stay legal. Prices start as low as $18.99, with pet shirts available too. WARNING: My SERVAL PHOTOS ARE BEING USED BY SCAMMERS, MAKE SURE THAT YOU ARE ONLY USING THE CONTACT INFO LISTED ON MY WEBSITE AND FACEBOOK PAGE, REPORT ANY SUSPECTED FRAUD TO ME AND THE WEBSITE THE SUSPECTED AD IS LISTED ON. THANK YOU, Ken. This site is now just a resource. I offer care sheets. This site is add supported, without the support from these ads, the caresheets would not be here. . THE TRUTH ABOUT BIG CAT RESCUE. Murder, sham... you be the judge.